The Original Cast of E.R. This Thursday, after 15 seasons and 331 episdes, County General will close it doors and ER will permanently enter the world of syndication. 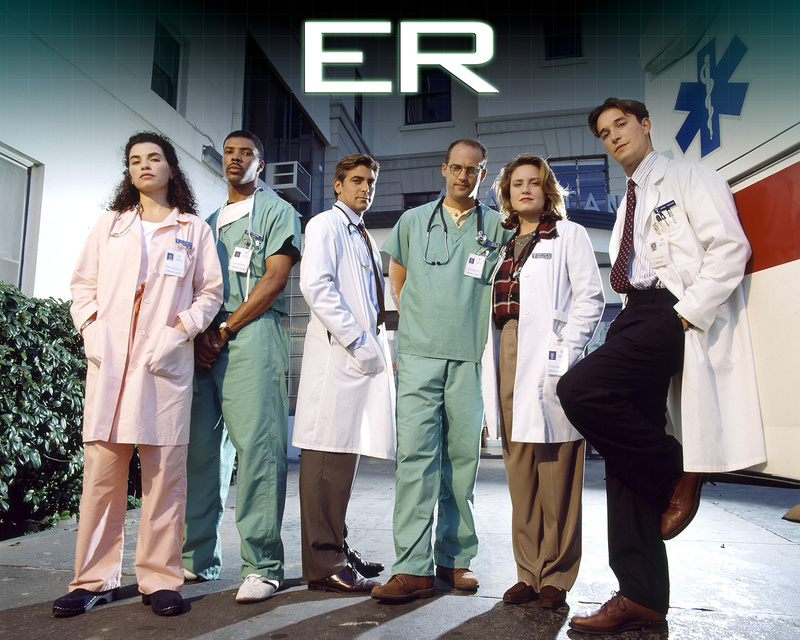 ER is the longest running American primetime medical drama. Created by Michael Crichton in 1974, the serial drama was intended to be a movie based on Crichton’s experiences as a medical resident. But it was not until Crichton teamed with Steven Spielberg to produce Jurassic Park in 1993 that ER became a television drama. In 1994, NBC looked the same as it does today; it had poorly developed television shows and was last-place in the weekly rankings. In fact, before ER came on the scene, NBC executives had planned on offering the 10 p.m. timeslot to Jay Leno, which is exactly what will happen following ER’s finale. Executives took a risk and agreed to broadcast ER, which no one expected to be successful. There were too many characters and too much gore. It did not follow standard narrative structure and used unorthodox filming techniques. In other words, it was too realistic. But when ER premiered on Sept. 19, 1994, it revitalized NBC and changed the television landcape forever. I discovered ER the same way I suspect many people my age did: TNT Daytime Drama. I started watching out it of boredom one summer and with four episodes airing per day, watching ER was something for me to do. Soon enough, I was addicted; I stopped eating dinner with my family so I could watch ER at 6 o’clock. I even made my parents tape ER when I went to summer camp for two weeks, completely defeating the purpose of summer camp. When I started watching, the glory years of ER, the days of Dr. Ross and Nurse Hathaway (played by George Clooney and Julianna Margulies) had just ended. But that didn’t matter to me. I was hooked and every Thursday since that summer, I haven’t missed an episode. While I watch other medical dramas, namely Grey’s Anatomy, I do so more because I enjoy mindless entertainment than because I’m being intrigued by compelling plotlines or dynamic characters. ER has the ability to attract an audience in a way that no other show is able to. While it has depended on the occasional helicopter falling on a doctor scenario to draw ratings, ER does not focus on extreme melodrama the way that Grey’s does. There isn’t some indie rock song guiding your emotions. And there definitely has never been the ghost of a doctor’s very dead boyfriend overstaying his welcome. When Grey’s Anatomy is currently television’s big thing, ER stayed away from following its lead. Instead, it continued with the same, albeit sometimes improbable, plotlines and character arches that had made it successful for over a decade. This is a testament to why ER is one of the greatest television shows of all-time and why Grey’s has become nothing more than a mockery. There is a moment is an early episode from this season, when Abby Lockhart (Maura Tierny) is led down a hallway by longtime ER nurse Haleh. They arrive at a wall that has every locker nameplate of past ER doctors and nurses on it. This scene is a testament to the longevity of the show. Former stars, most notably George Clooney, have returned to show fans what has happened to their characters since they left the show. So the show is going out that same way it came in; with a focus on exceptional writing and strong characters. ER, in many ways, has come to natural and logical end. ER’s conclusion is bittersweet. But as long as it doesn’t end with a kid shaking a snow globe and it all being a dream (a la St. Elsewhere), I’ll be content with the finale. I haven’t quite figured out what I’m going to do on Thursday nights at 10 p.m. for the rest of my life. Maybe some other great show will captivate my attention the way ER did. But I’m not counting on that. Instead, I’ll look forward to an ER reunion sometime in the future. The two-hour series finale of ER airs tonight at 9 p.m. on NBC. It is preceded by an hour long retrospective at 8 p.m.